Healthy food that truly tastes good. I know this sounds really lame coming from someone who loves to cook, but I went almost two years without a grill. And this sounds extra lame, but one of the reasons I went so long without a grill is that grills scare me a little. I've always viewed them as sort of a "man thing." Perhaps it's the open flame, the big chunks of meat, or the endless commercials featuring men holding court over their grills, opening a new set of tongs for father's day, or donning a cheesy apron that says "Grill on grill action." Anyway, I decided that if I'm going to call myself a decent cook, I had to get over my grill issues. So, a short trip to Home Depot and a few hundred bucks later, we became the proud owners of a new grill. It's nothing fancy--just a regular old gas grill. But this time, I refuse to shy away from it. So here are three recipes I've made on the grill over the last few months. They are all awesome and highly recommended by me and the people I've fed. One thing that all of these recipes have in common is big, bold flavor. I know that the act of grilling itself imparts a delicious charcoal flavor to food, but if you're a fan of slightly spicy, power-packed flavors, these recipes are for you. A lot of grill aficionados say to avoid grilling boneless, skinless chicken breast, as it can be dry and rubbery. I made this recipe three times, and not once was it dry or rubbery. The key is to use the freshest, highest quality chicken you can find, and to be careful not to overcook it. *A note: When I first made this dish, I didn't read carefully and I ended up using all 4 teaspoons of lime juice in the rub (you were supposed to use 1 tsp and save the rest for the salsa...whoops). BUT, it turned out awesome! 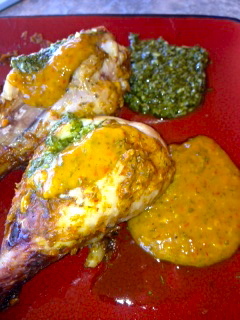 It made the rub a little more moist and kind of paste-like, so it adhered to the chicken better. Consequently, I recommend making the same mistake I did. I also OD'ed a little bit on the chipotle powder, which I also recommend if you like things spicy. Yes, I am aware that including the word "vomit" in a recipe is really disgusting and probably the least appetizing thing one can do. But what can I say? It was a nickname that stuck. Here's the thing...the sauce that accompanies the pork in this recipe (which includes apple cider vinegar, ketchup, brown sugar, and red pepper flakes) smells really terrible while it's cooking. It really does smell like, well, vomit. It got so bad that my husband made me set the pot outside until it was time to eat. But when you serve it alongside the spice-crusted pork? Pure deliciousness! I did tweak it a bit though. When I followed the recipe for the sauce exactly, it was a little too vinegary. So I added some more sweetness (a little extra brown sugar, as well as some maple syrup), and a little more heat (some hot sauce). Oh, and I didn't make the corn part of the recipe, so I can't vouch for that. But the pork and sauce was definitely a keeper. I just hope my kids don't go to school and tell their teacher they have vomit sauce for dinner sometimes. This dish is definitely a labor of love. It requires peeling mangos (which I find to be a huge pain) and using a food processor or blender two separate times--once for the chipotle-mango sauce and once for the chimichurri. Therefore, I recommend making this for a special occasion or weekend BBQ, not a Tuesday night dinner. The leftovers heat up well, though, so you could make a bunch and have it twice in one week. Also, although I didn't do it myself, I am sure either or both sauces would be excellent used in a different dish - perhaps with shrimp or another seafood. I'm still going to come to Arizona and eat your cooking someday . . . When my daughter was diagnosed with a severe dairy allergy, I became a label reader. Sure, I had checked nutrition labels for fat content & calories before, but ingredients? Why bother...I mean, what could possibly be in a frozen chicken nugget besides chicken, some breadcrumbs, and a few seasonings? A former processed food junkie, I found myself appalled by the things lurking in the "foods" I was eating. So I set off on a mission to spend more time in the kitchen, creating and uncovering recipes that were natural and healthy, but truly delicious as well. Click here for the dish that inspired the blog.